Plat dryer is a kind of grain conveying equipment, mainly divided into LPH series chain plate dryer and ZG series plate dryer. 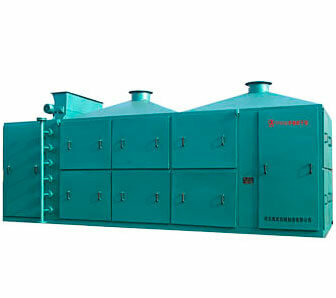 LPH series chain plate dryer, both can be used in the drying of billet material and can be used in the oil to soften, it can lower the energy consumption of steam instead of the commonly used frying pan and tumble dryer dry evaporate and work. ZG series plate dryer, soy leaching is a new technology is dedicated to the dry soybean germ moisture drying equipment, it to water ability, smooth operation, safe and reliable and can keep the soybean germ integrity, is the most ideal soybean a leaching process of drying up keeping. Flat bottom of the structure and working principle of the dryer is sandwich into the steam pressure (0.3 ~ 0.5 MPa), material of feeding mouth fall into the top plate, moving at a constant speed under the impetus of the scraper (linear speed is 1.2 ~ 1.5 m/min), to the end of the fall into the lower, the lower the direction, such horizontal movement and falling one by one, until the bottom of the discharge. Material stay in the machine for a time for 30 min. In this process, the material is steam heating, inside bottom interlayer materials heat absorption reaches a certain temperature, the water phase change and vaporizing discharge from the vent, water vapor condensation heat release, from the condensed water outlet at the bottom of the sandwich. So as to remove excess moisture, make nutritional material moisture into the leaching requirement.